Curriculum Section Three: Going for the Gold! 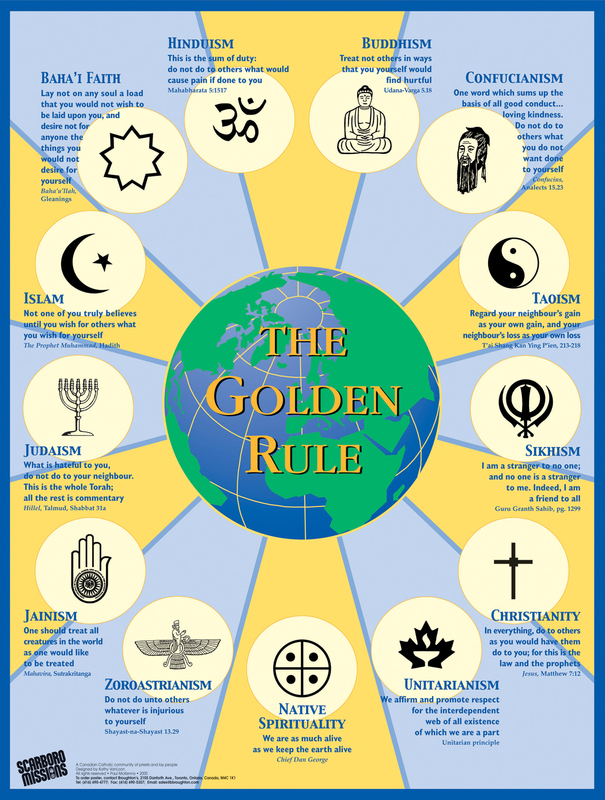 The students will be exposed to a visual representation of the ethic of reciprocity in the form of the Scarboro Missions Golden Rule Poster which features written versions of the Golden Rule from 13 of the world’s religions. The students will reflect on the Golden Rule and its application to their lives, particularly in light of the previous lessons in which they examined values, moral principles, and “rules for living” in terms of their relationship to their peers, their home situation, and the larger community. The students will also reflect on the symbolic and visual features of the poster. This section of the unit deals with 13 expressions of the Golden Rule. Please note that there are many more than 13. 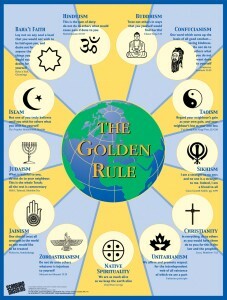 In fact, researchers have discovered hundreds of “Golden Rules”, from ancient and modern sources, as well as from religious and non-religious sources. The reason for the use of only 13 here is because this unit utilizes the Scarboro Missions Golden Rule Poster which features 13 expressions. Teachers may want to expose students to additional versions of the Golden Rule from other sources, including secular or non-religious sources. Additional versions of the Golden Rule can be found by an Internet search under the category of “Golden Rule”. There are many websites that contain long lists of Golden Rules. Prior to teaching this Section, the teacher may find it helpful to read and reflect on some of the five articles that are linked below. The first three are posted on the Scarboro Missions website and the final two are found in the Appendices section of this document.